If you’ve visited Dr. Gena Chiropractic before or even have the pleasure of knowing her personally, you know that one of her favorite things in life is getting to work with children. From the way her face lights up when any of her pediatric patients walk through the door, to her gentle touch and fun, engaging way of making kids feel at ease during a chiropractic visit – there is no chiropractor anywhere who makes a child’s visit for chiropractic care as exciting as Dr. Gena. Take me, for example. I have a 16-month-old daughter, Bella, who has just entered the throes of separation anxiety, making our visits to Dr. Gena for our much-needed adjustments a little, well, tricky. Imagine adjusting a mommy when her child won’t let go of her, or even more difficult, adjusting a child who won’t part from her mommy’s arms – seems impossible right? Sure. Unless, of course, you’re Dr. Gena. Upon walking into Dr. Gena’s beautiful Fort Lauderdale office for the first time, my daughter and I were both welcomed by warm, friendly smiles from the cheerful front desk staff. The fact that these lovely ladies greeted my daughter by name instantly put me at ease, and triggered an automatic smile from my child. Within seconds, we were led to a play area with endless toys, books, and stuffed animals where my daughter made herself at home without hesitation. This allowed me enough time to check-in, do my pre-adjustment exercises, and get ready for some much needed relief from the magical hands of Dr. Gena. Much to m y surprise, Dr. Gena sprung into action. 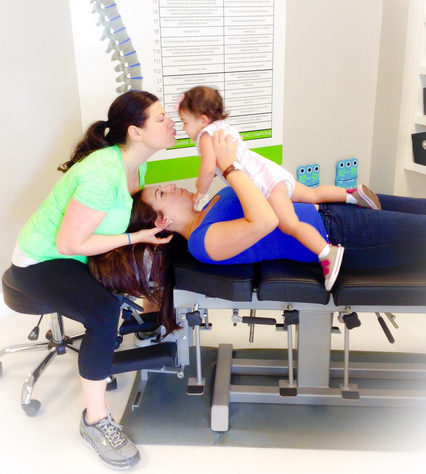 She began allowing my daughter to be a part of the adjustment, which reinforced the feeling that she was still connected to mommy – a huge relief for both of us! Dr. Gena assisted my daughter in “treating me,” showing her how to do a leg check, use the activator, oh, and she even taught my daughter her famous “fishy face” to keep her entertained. Magically, her tears turned to giggles, and she felt comfortable enough in Dr. Gena’s hands to have her own little body adjusted. As if she had been visiting Dr. Gena for chiropractic care and adjustments her whole life, my daughter laid still on the table with a smile on her face, excited to be in the care of her new favorite fishy-face-making friend. I have to admit that I was so impressed. And not because I ever doubted Dr. Gena’s ability with children – I knew she had a reputation of being the best chiropractor for kids in South Florida. But there was something about her energy and how it transferred over to my daughter as if to tell her, “I’m here to help you and mommy, and I’m really fun too!”. Now, going to Dr. Gena’s is easy. I know have a team of caring, helpful professionals to assist my little girl and I through our visit – making Dr. Gena the only chiropractor for us!